I can’t believe it’s finally Friday. You know what that means? As Jim Carrey says in The Mask: “It’s party time!” I am so ready for this weekend. I’m ready to be able to sleep in tomorrow. I’m ready for the rest and a little bit of fun. I’m not ready for all the kids to be home because it won’t be quiet or peaceful in the least, but it will be good to have more help containing the 2 yr old tornado (who will be turning 3 in three weeks). This weekend will be the first weekend in a while that I’ve had nothing scheduled, nothing going on. I am going to relax and take it easy. I plan on using it to work on one of the three stories and maybe go see a movie. Although, writing is going to be interesting as I cut a finger on my left hand and, of course, it’d be one I use to type with. So typing is going slowly at the moment. I probably should have gone in and had a couple of stitches put in but it seems ok for now. I’m tough. I can take it. I’m a Texas girl. Some Neosporin and some gauze and I’m right as rain. But remind me next time I start complaining about how boring my life is that I should probably not test the Universe. Cutting my finger was not fun, and I apologize for wanting things to be a little more interesting yesterday. I didn’t want THAT kind of interesting. Injuries I can do without. And before I forget, this is actually the second post for today. There was a hiccup with yesterday’s post, which I did write, and it did not get posted. So, I posted it this morning and you can scroll down to read it should you so choose. Today begins the new schedule I have decided on for Fridays, which is posting poems or writings, or links to them, that I like, love, and think should be read and enjoyed. The first thing I want you to check out is my Twitter friend Taylor’s flash/micro fiction. She’s over at Little Write Lies. I’ve mentioned her in my post about my writing process. Since that post she has released the news that she is finally publishing an ebook containing some of her flash and micro fiction. It’s going to be called The Suicide of the Moon and you can read the news about it here. Taylor is really an incredible writer. She has so many good stories and every time I read one I just feel like everything I write is garbage. (Don’t worry, I like what I write. But I like her writing as well.) She has some I would love to see her continue into something longer but I love how she leaves you wanting that. She’s funny and I’m grateful that she gets my sense of humor. I also love that when I posted a partial lyric on Twitter she responded back with the next lines. Taylor, you are the awesomest! Anyway, go check her out. The stories I love by her are: We Danced, Conquest (you should also read Satellites before reading Conquest though-it’s as if they are before and after of the same story), and The Only Cartographer. I am still going through her stories, one at a time, because I really like being able to just sit and read and take in the story. I think one of the problems with most relationships is that we, especially women, go into them thinking if we don’t like something about the person we’re with then we can change that person into what/who we want. “I love you, but I don’t like this about you,” we think. Or, “I love you, darling, but you do have this little habit that annoys me.” What we should be thinking is: “it’s who you are and I love you anyway.” Why should we try and change someone? Why do you love this person if you don’t like them very much or you don’t like that noise they make when they chew their food? I’m not saying we don’t all have habits that bother others, but if you love someone, these shouldn’t make you try and change them. I think that if you love someone, you should try and better yourself for them. I don’t mean change. I mean become a better person. Be kinder, be gentler, be happier, be more understanding, be a better listener, or be more patient. Don’t try and change them. Change yourself, your bad habits that you know you have. If you have a quick temper, work on that. If you don’t pick your dirty clothes up and put them in the hamper, well, then, pick them up. But don’t change because you have to, change because you want to. Now, I’m going to post this sonnet and then go change the bandage on this finger. Yes, you should be careful when you ask the universe to make things more interesting or exciting. You may get more than you bargained for. Been there, done that, and bought the t-shirt. Sorry to hear about the finger. I hope it heals well and quickly. And for the record, I love Shakespeare, so you can post as much of The Bard’s writing as you like as far as I’m concerned. Just a few of my favorites of his plays are Henry V, especially the St. Crispin’s Day speech, A Midsummer Night’s Dream, and Hamlet. I have an edition of The Complete Shakespeare with photos from many of the performances in London and Stratford-upon-Avon. Glad to hear you are working on your stories. Keep that writing flowing. I’m trying to tie up some loose ends on a story to finish it this weekend hopefully. Wow! I’m so honored to be featured on your blog, Jessica! 😀 Thanks so much! 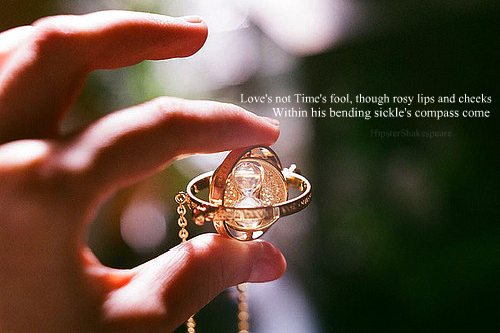 And beyond that, the sonnet is beautiful. I think you’re spot on with being accepting of your partner in a relationship and being a kinder, gentler person in general. Great post!